By the early-1980s, American car buyers were starting to value comfort and style more than outright function. This shift in taste hit AMC's Jeep Division particularly hard, and their legendary Jeep CJ7 off-roader was starting to languish on dealer lots. Since the company desperately needed to regain market share, they wisely decided to create a new 4x4 that people might actually want to buy. The result became known as the Jeep Wrangler YJ, and it drew immediate ire from Jeep loyalists over its "flashy" styling and perceived "softening" (the Wrangler YJ didn't have as much ground clearance as the CJ-7, and the suspension was tuned for better on-road behavior). Nevertheless, the plucky little planet rover proved itself to be just as capable as its predecessor, and Chrysler's marketing muscle helped to attract younger, more affluent Wrangler buyers. Many of these customers however, didn't buy the YJ Wrangler for its off-road capability. So to them, the standard AMC 2.5L engine worked just fine in the city, or cruising down the beach. But if you want to get more power out of your 1991-1995 Jeep Wrangler 2.5L (w/o ABS), an AIRAID 312-176 Cold Air Dam performance intake system can provide the extra torque you're looking for. your Jeep Wrangler 2.5L relies on outside air to burn the fuel inside the motor. It comes in through a small hole at the bottom of the air box, then the air is forced through a layer of dirt that collects on the surface of the paper Wrangler YJ air filter. Not only does the air box restrict airflow, those 'surface loading' filters further reduce the amount and velocity of air that reaches the motor. This results in lost power. 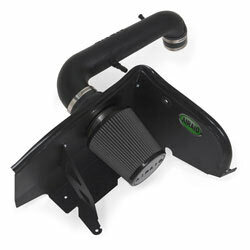 An AIRAID 312-176 Cold Air Dam intake is designed to increase horsepower and torque by reducing these restrictions. It does this by replacing the OE air box with a high-flow AIRAID SynthaMax air filter, surrounded by a rugged self-sealing Cold Air Dam. When the hood is closed, it rests on a rubber gasket that prevents hot engine air from reaching the oversized AIRAID performance air filter. 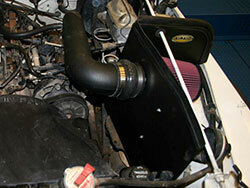 This cold air chamber is positioned to direct a much higher volume of cold air into the intake. But first, that air has to be cleaned. It doesn't matter where you drive, there will be dirt particles in the air. To stop them from reaching your motor, an AIRAID SynthaMax performance air filter uses two distinct layers of synthetic material. The first is made from needlefelt polyester, and it's designed to stop large dirt and debris in wet or dry conditions. The second/inner layer of wet-laid, chemical bonded rayon and polyester traps fine dust, and other contaminants that may be too small to see with the naked eye. This low restriction material provides unparalleled airflow, because the dirt stays trapped inside of the material, instead of on the surface. Plus, you won't have to clean it for up to 50,000 miles (depending on road conditions). Once the air has been cleaned, it passes into a low restriction intake tube that has been aerodynamically designed to reduce airflow restrictions and air turbulence. This allows air to travel to the intake and a much greater speed, which improves the fuel and air mixture. Combine the velocity with the additional oxygen molecules in the cold air, and you have a much hotter fuel detonation that results in considerably more horsepower and torque. And since none of the factory emission control components are modified, the AIRAID 312-176 Cold Air Dam intake system is street legal in all 50 states.